For spring break this year our family decided to take a cruise. Normally we sail away on the Disney Cruise, but we booked our vacation last minute & Disney did not have availability. The 5 night cruise aboard the “Carnival Inspiration” was one of the few ships that we were able to find an available cabin, so we booked it! Minutes later I was surfing the web, trying to find any information about Vegan dining on this ship, or any Carnival ship. But information was hard to find. I came across a few comments here & there, but nothing too helpful. I did read that is important to let your server know of any dietary restrictions during the first evening on board. My husband and I explained our Vegan diet to the server as soon as she greeted us. She explained that we would be working with a “special diet hostess’ during the week, and we should find plenty to eat. This was music to our ears. Our dinner that first night was a simple gluten free penne with marinara sauce, and I must say, it was excellent. I don’t usually enjoy gluten free pasta, but this was a good one. During our meal the “special diet hostess” came by and pre-ordered our dinner for the next evening. This is what we would do each night. For dessert our only option was a fruit platter, but we were assured that we would have better desserts throughout the week. Cookies & cakes were mentioned…. The next evening we were told that our dinner “pre-order” had been accidentally deleted and all they were able to make for us were grilled vegetables & rice or the same pasta as the night before. My husband and I chose the vegetables & the kids ordered the pasta. We all enjoyed our food. Unfortunately, the fruit platter was still the only “dessert” we were offered again. The kids were not happy. We were told that homemade cookies would be made for us tomorrow…..
For breakfast each morning we stuck to toast with jam, cereal and fruit. Soymilk was always available. Lunch each afternoon was a treat! 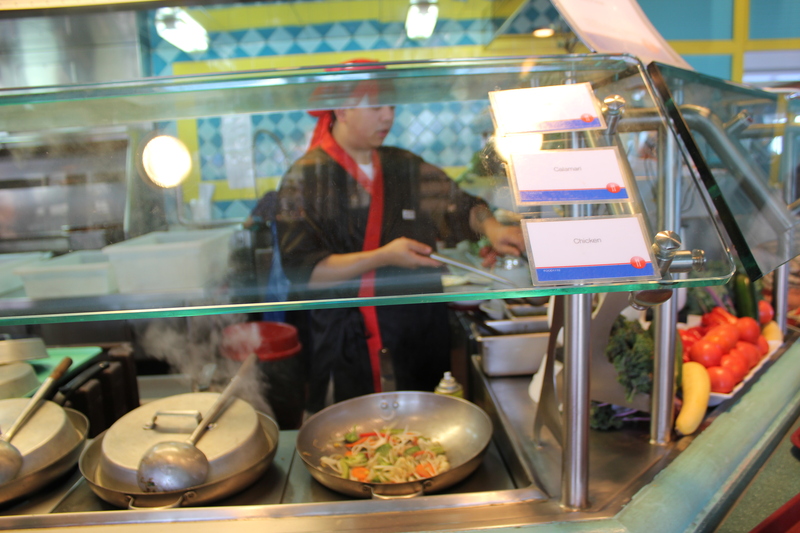 There is a noodle station where rice noodles & vegetables are made to order. The chef uses chicken stock to stir fry, so he had us bring him a cup of water to cook with each time. The kids LOVED this, and so did my husband and I! Best Vegan food on the ship, no joke! Aside from the noodle station, there is a large salad bar & a grilled panini station. It would have been nice if they offered a vegan entree’ along the buffet line, but we still found plenty to eat. 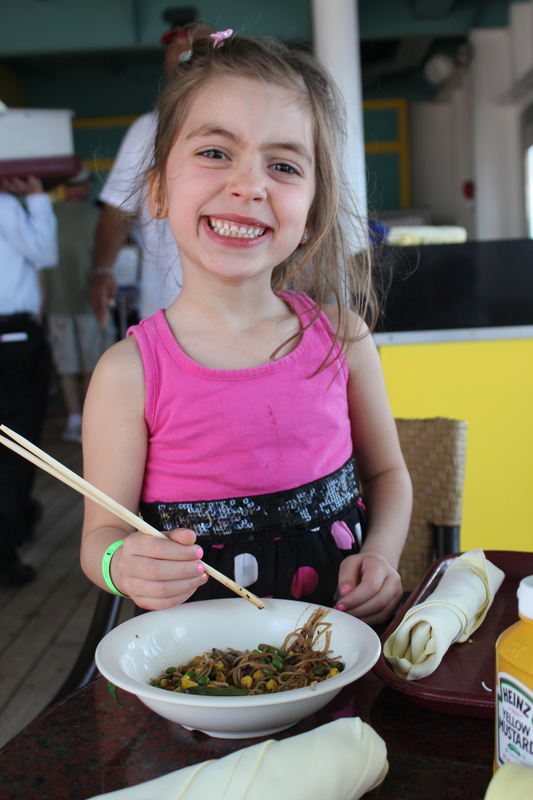 Our third dinner on the ship was a delicious vegetable fried rice! How were the cookies you ask? Non existent. We had fruit again. 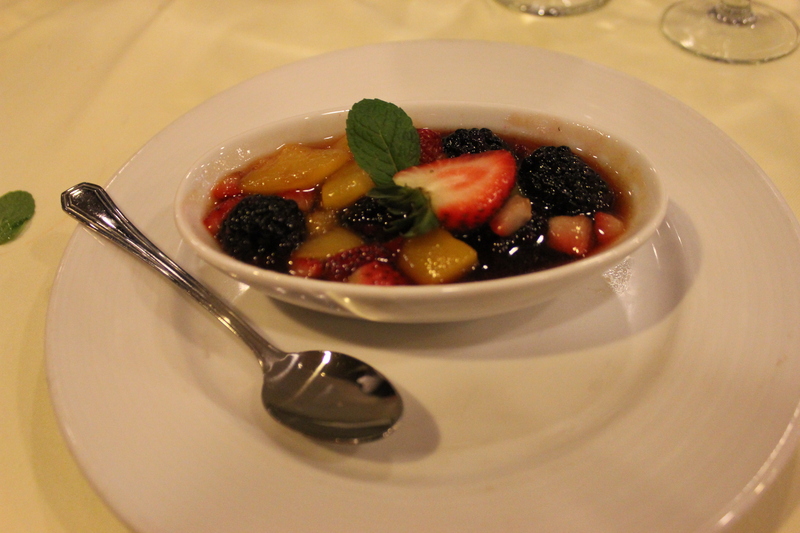 This time it was cooked berries in a sugared sauce. Good, but still fruit. Thank goodness I brought my own cookies for the kids. Poor things were on vacation and they couldn’t get one decent dessert! I was seriously going to offer my Vegan baking expertise to the kitchen staff and teach them how to whip something up, but my husband thought that was tacky. The 4th evening we did not make it on the ship in time for dinner in the dining room (too busy discovering ancient Mayan ruins), so we grabbed some veggie sushi & a grilled veggie panini at the buffet. Quite good actually. 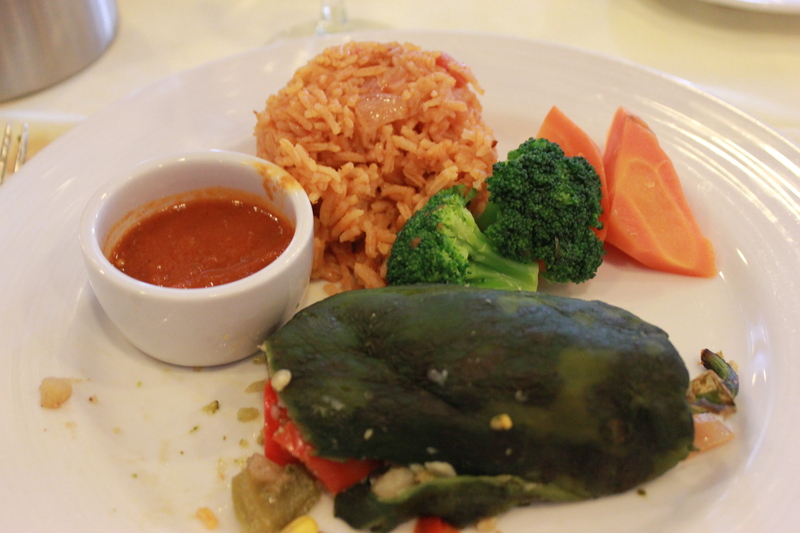 Our last dinner on the ship were vegan stuffed peppers, and we all enjoyed them. 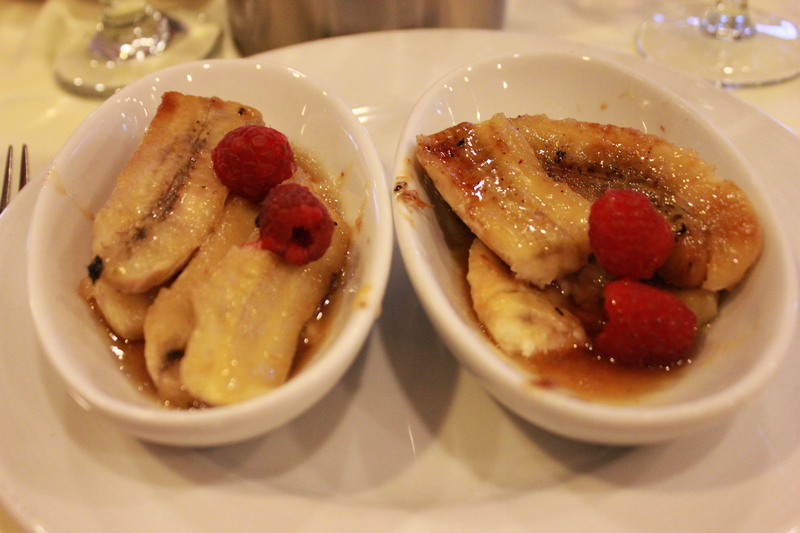 Bananas were our dessert. Surprise, surprise. Overall we had a great time. I feel that Carnival has the right idea, offering a “special diet hostess” to work with guests, but I do think they are dropping the ball when it comes to dessert. Vegan cakes & cookies are not difficult to make, and if Carnival Cruise Line put a little more effort into catering to vegan guests, they would get 2 thumbs up by “The Vegan Mom” instead of one.